Cloud System Care might look like a reliable and useful tool, but it is nothing of the sort because it will not deliver you the promised features but demand that you purchase the license key. We have classified it as a potentially unwanted program and suggest that you remove it because of the fact that it is good for nothing. Note that it is not malicious and should not put your computer’s security at risk. Its developers are only interested in money, and if you are thinking about purchasing it, then we urge you not to because you would be throwing your money away. We have tested this application and believe that classifying it as a potentially unwanted program was justified, but please continue reading to find out more. Before we discuss this program’s gimmicky features, let us talk about its origins, even though there is not much to talk about. Apparently, this application was created by Epicsoft, a questionable software developer that did not digitally sign it. Therefore, there is no way of knowing whether you can trust this application to deliver you a reliable service. The truth is that Cloud System Care is no different from hundreds of other fake optimization programs that include the likes of PC Accelerate Pro, PC Clean Plus, PC Clean Maestro, SpeedingUpMyPC, and many others. Now let us talk distribution because it is important to know where it is hosted to avoid getting it unintentionally. 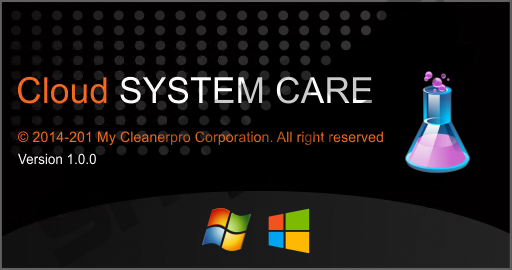 Our research has revealed that its download is currently hosted on a website called Mycleanerpro.com that claims that this program will protect, clean and optimize your PC. It also says that it has over 1 million downloads worldwide which is hard to believe considering how unpopular it really is. We have also found that it is featured on another website at Epicsofts.com which, apparently, features other shady applications as well. However, our biggest concern is the fact that Cloud System Care might come bundled with freeware installers that can install this application without your knowledge or approval. Such installers are bound to be featured on freeware sharing sites, so make sure to opt for advanced installation settings and deselect it if possible. If you install this program on your PC and scan your computer with it, then it will show you fake scan results. We have tested this program on a clean computer, and its scan results showed that the computer has many issues which it clearly did not. This program found legitimate registry keys as threats, so that is all you need to know about this shady scanner. Allegedly, this application is designed to delete temporary files that tend to clutter the system over time and other junk files that are left after uninstalling an application. Like many programs like it, Cloud System Care claims that it can fix registry errors and protect your computer from malware and even protect your privacy. However, this all in one application seems to do nothing of the sort, but its developers would like you to pay $95 USD for it. Now, if you click Optimize once the scan is complete, it will open a dialog box in which you have to enter the license key. Interestingly, the texts asks “Your Trial version has Expired?” but the fact is that there is no trial version at all as you cannot optimize your PC right from the beginning. Also, Cloud System Care features an invalid “000-000-000” phone number. Moreover, in the registry scan tab, if you "Go to Key", "Go to folder", or "Item details" this application will crash immediately. Is this the kind of application you want to invest in? Surely not, so we recommend that you get rid of its “trial version” altogether. In conclusion, Cloud System Care is a fake PC optimization tool that promises a clean and optimized computer, but we think that it will not deliver on this promise. It comes from a shady background like many so-called “optimizers” do and is apt to classify legitimate registry keys as threats. Furthermore, in certain scenarios it can crash entirely, so do not waste your money on this unreliable application, please follow our instructions on how to remove it. Enter Control Panel in the search bar located on the Taskbar. Go to Uninstall a program and find the software and right-click it. Find the application, right-click it and click Uninstall. Find the program and right-click it. Find and highlight the software. Enter the following file paths in the address line. Find the Cloud System Care folder. Right-click it and click Delete. Quick & tested solution for Cloud System Care removal.